Provided HVAC, plumbing, and fire protection design for a 42,000 SF office building. The HVAC system included three 70‑ton air cooled chillers and VAV type air systems. Provided HVAC and plumbing for the Alum Sludge Facility & Northside Pump Station Facility, including pressurization of the MCC room and lab. Provided the design of the HVAC, gas, pressure air, vacuum, and emergency exhaust systems for the new 4,800 SF lab/maintenance building. Performed an HVAC study on an existing 142,000 SF operations and maintenance facility. Provided mechanical design for the installation of two 200‑ton water cooled chillers. 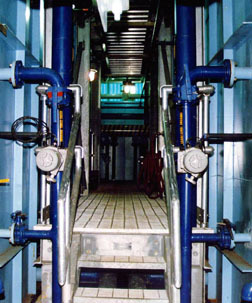 Design included mechanical room ventilation and change‑over from a single loop water system to a primary/secondary loop arrangement and control logic.